Writer Roger Schulman will be penning the script. Roger wrote Balto and Shrek. Supposedly this project has been trying to get made for a while now. I imagine since Pirates of the Caribbean has done so well for Disney. No director is attached yet, but I wouldn’t be surprised if Hanks would try to get the directing gig or at least he was offered the job. This could turn out to be a very good film and story. 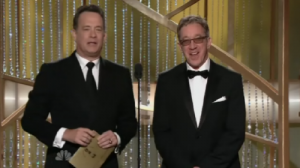 Maybe a live action packed adventure film with Hanks and Allen with some comedy. Think Indiana Jones style film with those two. I think that could be a great family adventure film. This entry was posted on Thursday, March 3rd, 2011 at 12:42 pm	and is filed under Film, News. You can follow any responses to this entry through the RSS 2.0 feed. You can skip to the end and leave a response. Pinging is currently not allowed. « Another Peter Pan Film Gains Steam!! !